With absolutely no activities planned, we used our rest day to relax and recharge. We lounged and visited and just enjoyed the scenery. 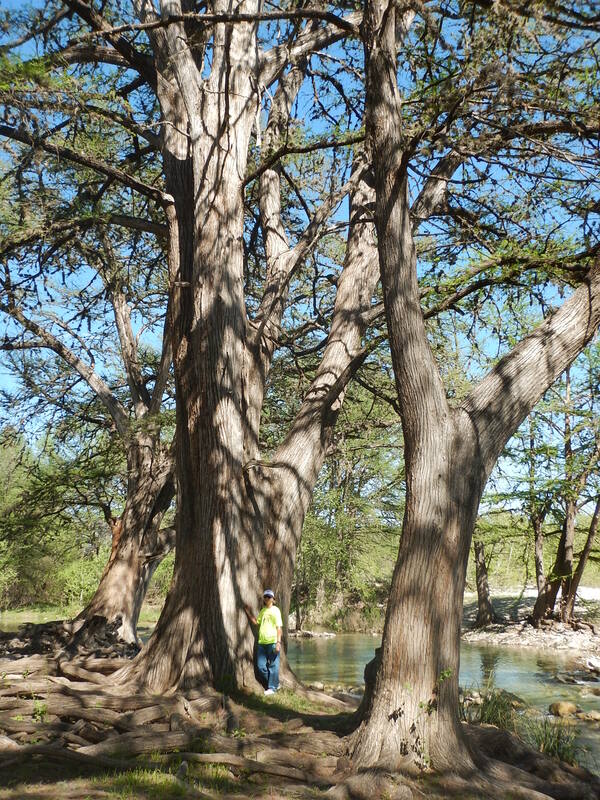 After lunch we walked along the Rio Frio River, admiring the crystal clear water and the incredibly old, magnificent cedar trees. 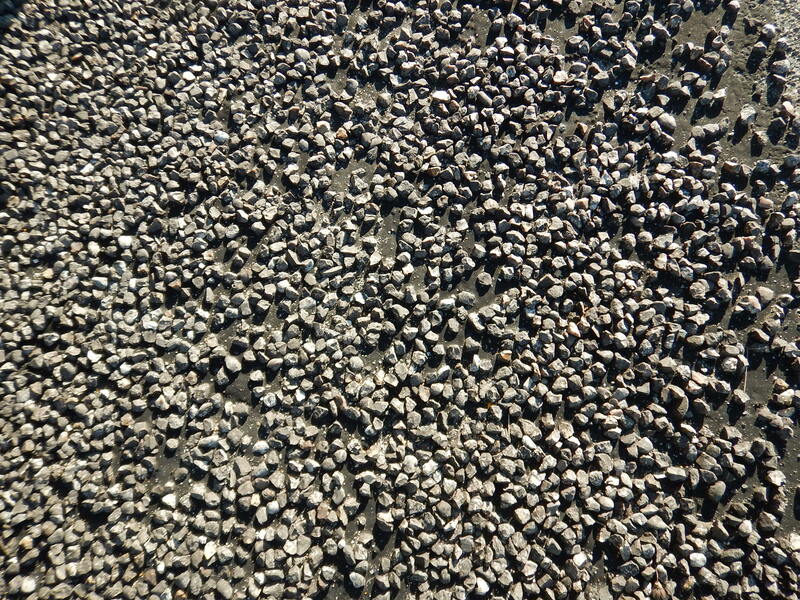 The rear tire that we dipped into the Pacific on March 4th is no longer on the bike. It served us well, but it is worn out, a victim of the Texas chip seal. Here’s some gen-u-ine fresh chip seal. See how rough it is? 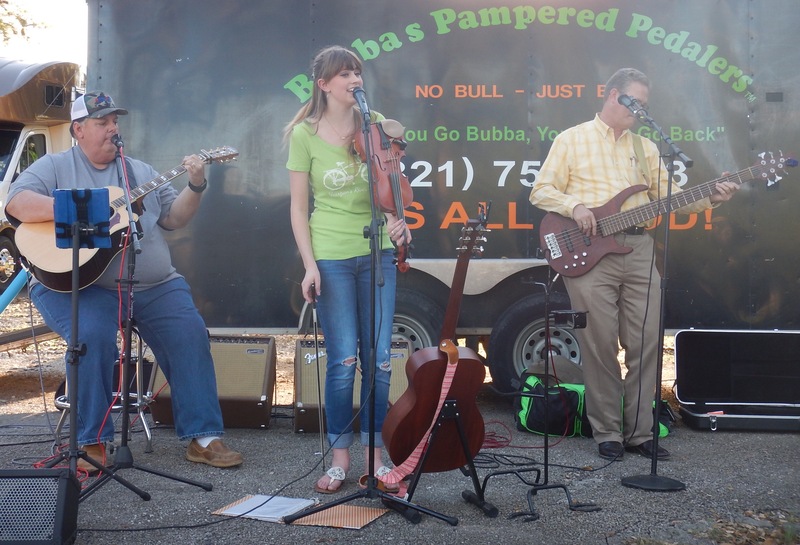 After dinner we were treated to a performance by Camille Sanders, a charming and talented singer, songwriter and fiddle player. We think you’ll hear about her soon! Today, we hit the halfway point of our ride. 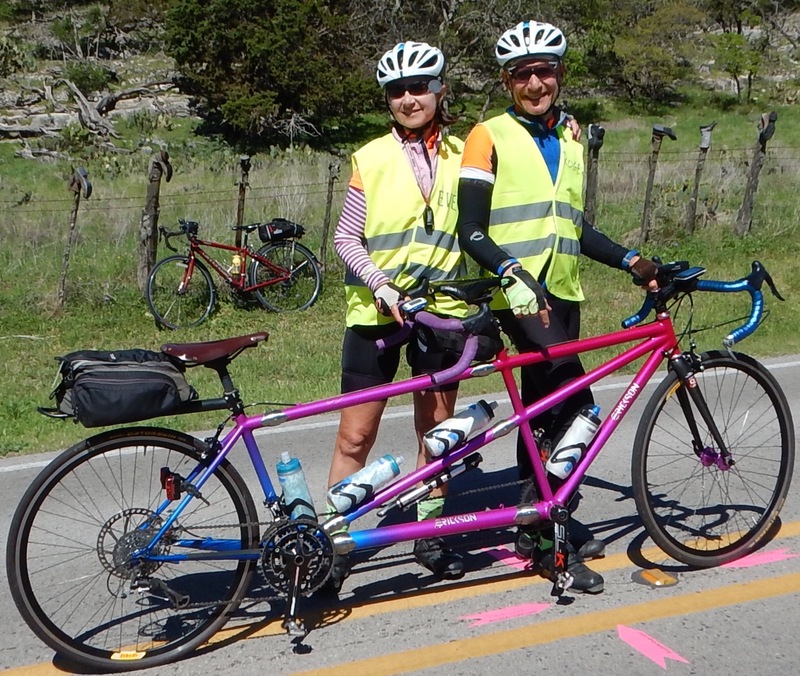 After 25 miles of uphill, the rest of the day is a tandem-friendly downhill slope that follows the Guadalupe River. Have we finished half of the ride, or do we have half of it to go? Depends on how you look at things. The official unofficial halfway point is at the “boot ranch”. 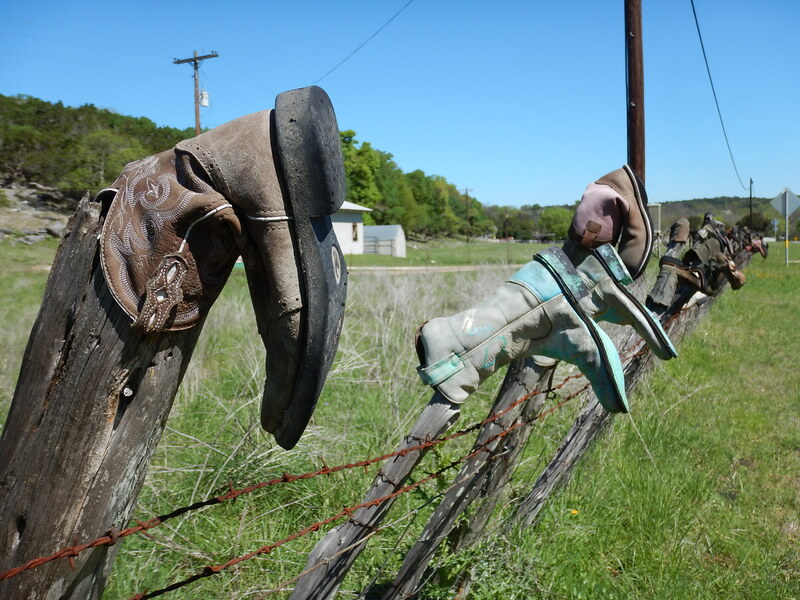 Hundreds of cowboy boots adorn the fence posts. We stop for our photo at “the spot”. There’s nothing like a siesta in the middle of the road. Tonight, there’s a special celebration meal from Chef Anne. 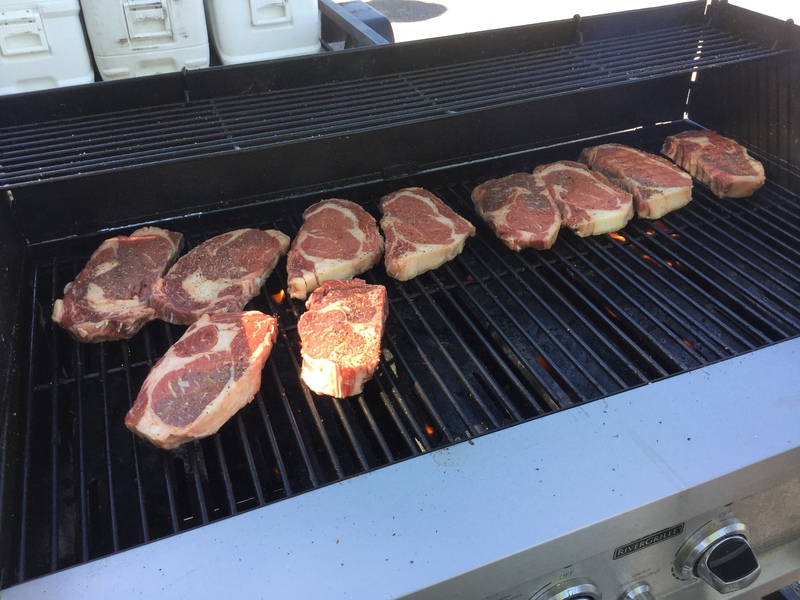 Ribeye steaks should do the trick. And if that doesn’t work, the open bar will keep the party going. The crappy beer is in the cans on top. 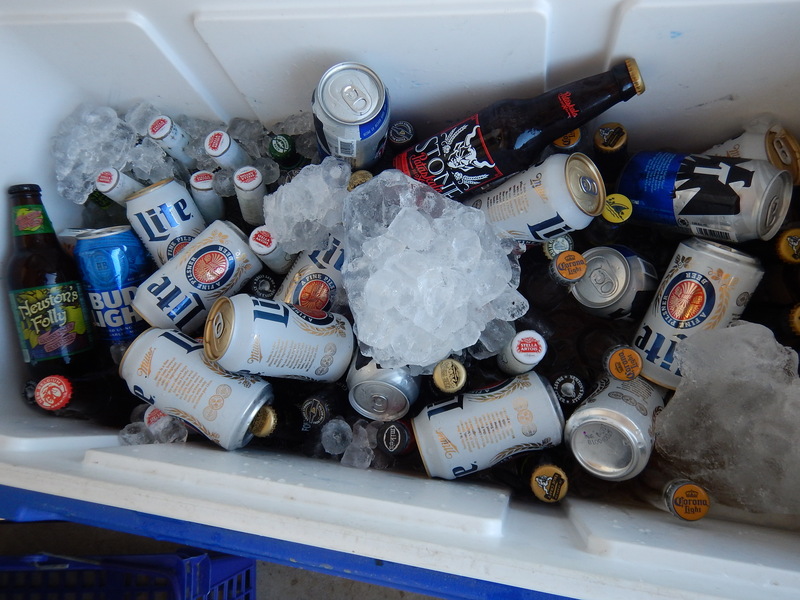 If you dig down to the bottles, there are some hidden gems. Tomorrow: Our assault on Texas hill country continues. I’ve been wondering how the Contis were holding up to the chip-seal. Hope there was shade for dealing with that! Changed the tire in the shade of a live oak on our day off. Has anyone dropped out yet? Half way there and miles to go but I know you two can do it! Keep smiling, pedaling and eating those delicious looking meals! Someone fell and broke his hip 6 miles into the first day of the ride. He didn’t have trip insurance, so the ride cost him $1500 a mile. Have fun in Havana. You finally get there 60+ Years after your honeymoon. 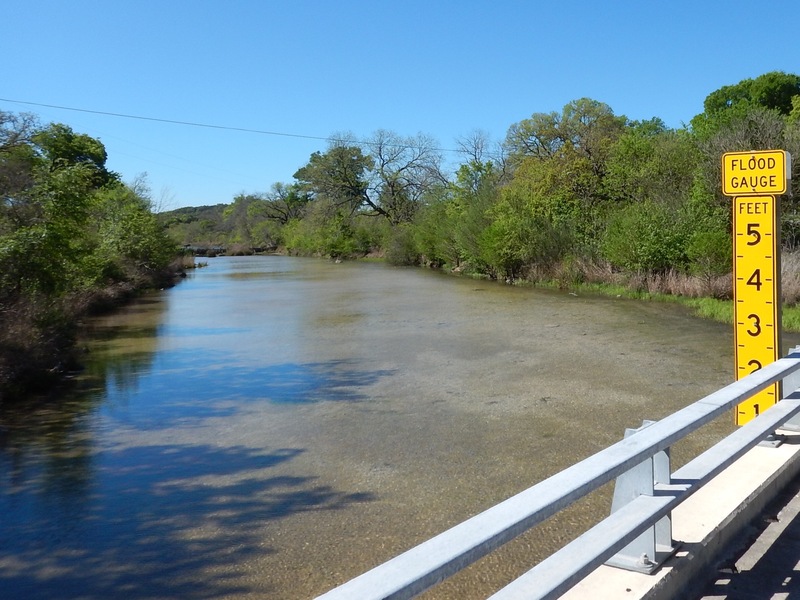 We love the Texas Hill Country. 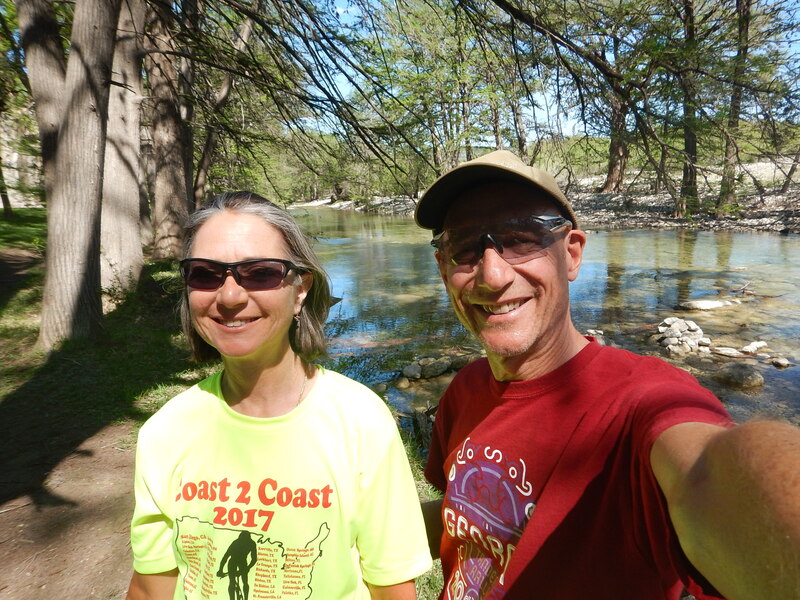 We’ve done Southwest Tandem Rallies in Kerrville, Fredricksburg and Georgetown, and before that, a number of charity rides with some former bike race guy from the area that we’ve since wiped from memory. If there’s anything better than chip seal it’s got to be a good ole fashioned Texas Cattle Guard, 5-6 pipes across the road that are guaranteed to bruise your buttocks if you don’t lift off the saddle in time. We’ve been over the CG’s a hundred times or more. Hopefully your route will be more on the main roads and avoids them. 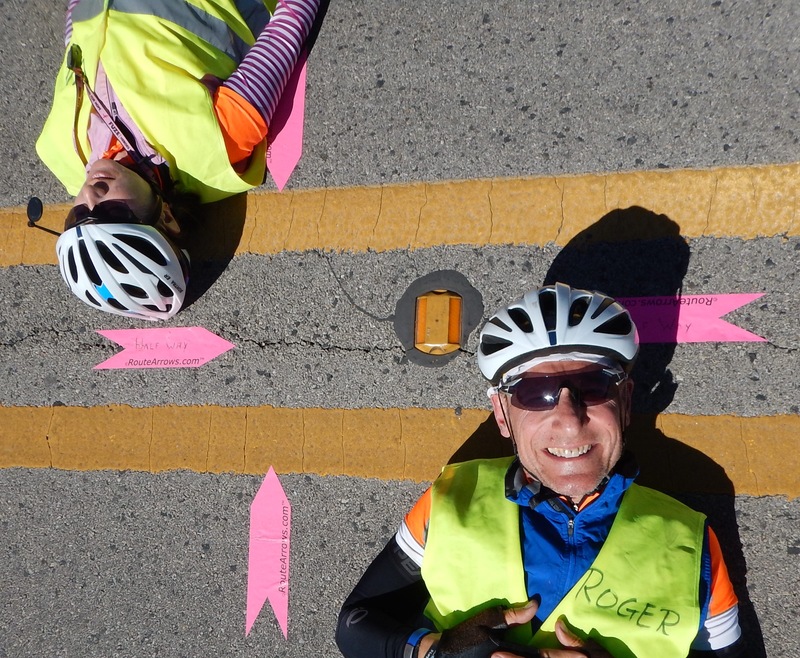 Loving the blog, go team Eve & Roger! Not to worry…we have had our share of cattle guards. Not many lately, but there’s always those low water crossings looming! So did you sit in with the band? Congrats on half way there. All downhill from there, correct? deserve it as well as the bottom-of-the cooler treats! in the middle of the road! That’s an original! 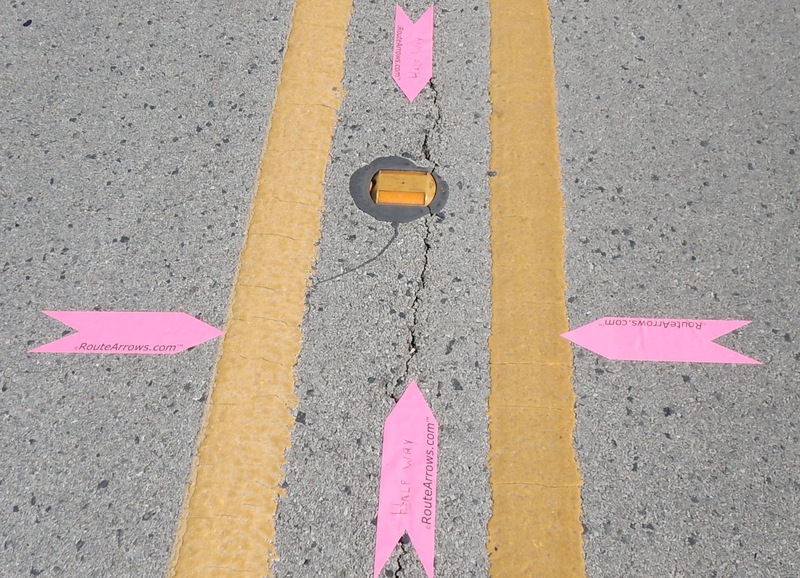 Chip seal and heat we’ve experienced, but those cattle guards? Yikes! At least they wouldn’t last as long as the rough chip seal. 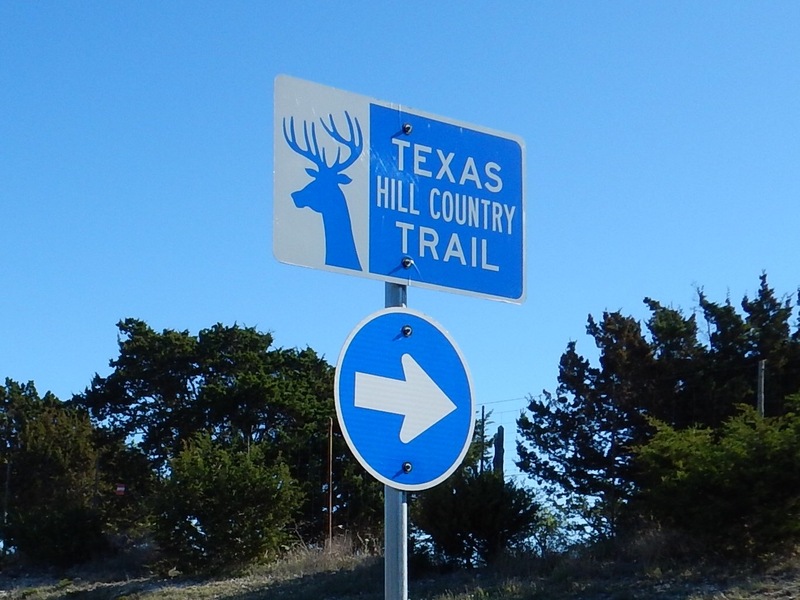 been following your blog from the start….welcome to Texas Hill Country and I have ridden there many times over the year. Nice to be here. We are in search of bluebonnets!